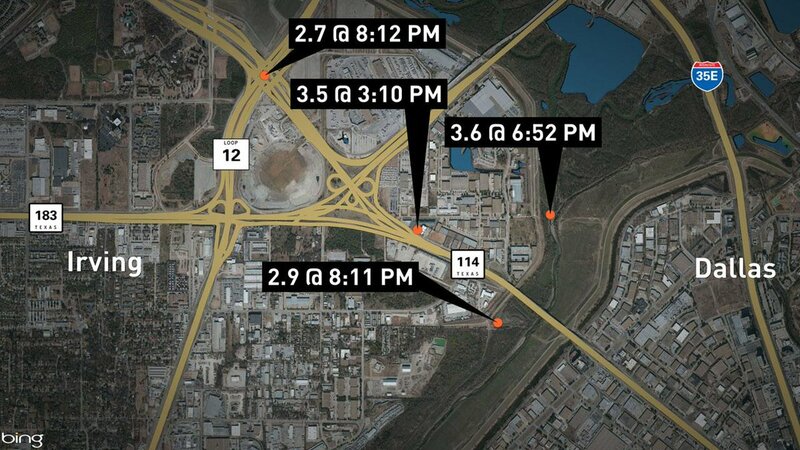 WFAA Channel 8 map of four quakes confirmed by 10:00 p.m. news casts, showing how close the quakes are in proximity to each other and the site of the old Cowboys Football Stadium. This Tweet from our local NBC TV affiliate sums it up nicely. North Texas shook yesterday — not big quakes, but a bunch of ’em — and that doesn’t sit well with Texas oil executives, since it seems likely gas and oil drilling, especially hydraulic fracturing (fracking), and especially waste-water reinjection seem to be causes. I grew up in Utah. We had quakes you could feel, at least weekly. Our home sat less than a mile west of the Wasatch Fault. Many mornings my mother would stand drinking her coffee, looking over the stove and out our kitchen window at Mt. Timpanogos, remarking on the earthquakes. Most often we couldn’t feel them, but the power and telephone lines that slashed through our $10 million view of the mountain would dance in sine waves during quakes. It was pretty cool. Along the more famous faults, one rarely comes on more than a couple of quakes a day. Dallas — more accurately, Irving — is far away from most major faults, and rarely has more than a couple of quakes a year in recent human history. 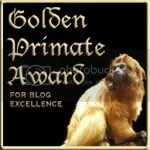 So this swarm of quakes makes news! DALLAS (CBSDFW.COM/AP) – Nine earthquakes, three of them with a 3-point magnitude or greater, rocked North Texas Tuesday into early Wednesday, knocking items off walls, causing cracks to appear in ceilings and generally rattling nerves across the region. “The last one really shook,” said CBS 11 anchor and reporter Ken Molestina, who felt the the earth move in the White Rock Lake area of Dallas. The latest quake, reported just before 1 a.m. Wednesday, measured in at a 3.1 magnitude, and was centered near the convergence of State Highway 114, Loop 12, and the Airport Freeway near the old Texas Stadium site in Irving. Others felt the temblor in the Uptown area of Dallas and as far away as Bedford and Mesquite. 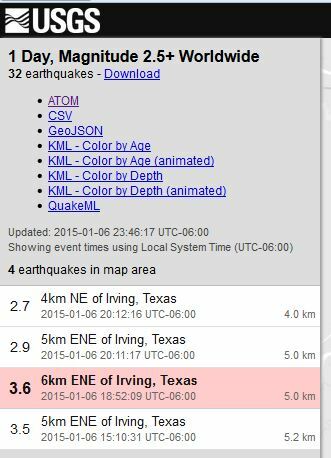 At last count Tuesday night, there had been 24 or more earthquakes in the Irving area since November 1, 2014. Jokes fly, too. Not this much shaking since Elvis toured the area heavily in 1957, some say. Recent studies show earthquakes in other areas linked to oil and gas drilling and extraction. All of these quakes are in close proximity to working wells or wells being drilled. What’s the Earth trying to tell us? 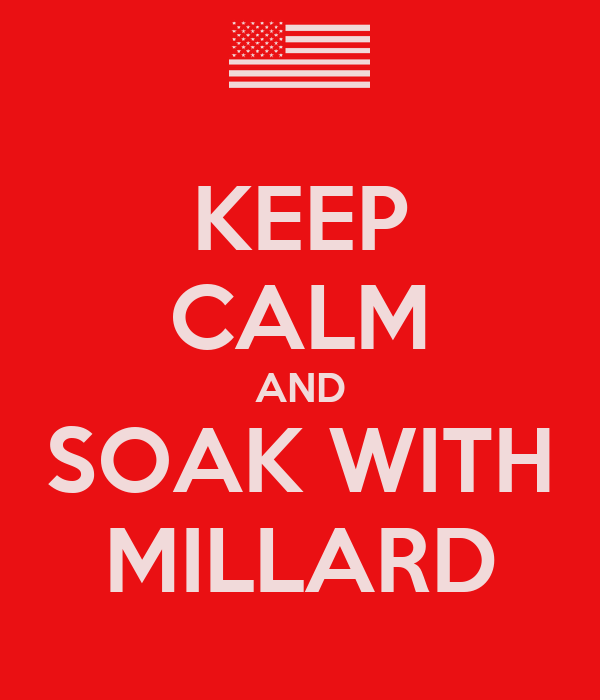 Did this whole thing start back in 2008 with a small swarm of quakes? Historically, Texas has not been a hotbed of earthquake activity, between 1973 and 2012. Texas Seismicity Map from USGS.